(Cinet)- The Vietnam Association of Photographic Artists and the Quang Nam provincial People’s Committee organized the 21st South-Central Coast and Central Highlands region photo festival on July 28. With a theme of “the South-Central Coast and Central Highlands’country and people”, the festival attracted authors from 10 provinces including Binh Dinh, Da Nang, Dak Lak, Gia Lai, Khanh Hoa, Kon Tum, Phu Yen, Quang Nam and Quang Ngai. The event offers the chance for artists to meet, exchange ideas and show their artwork to the public. 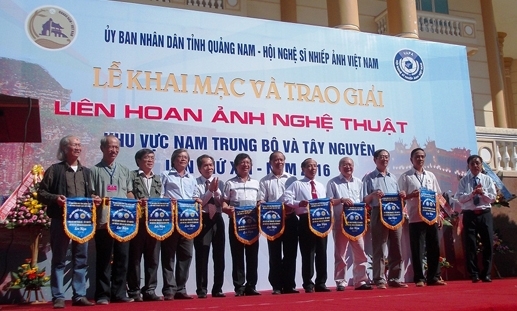 An exhibition was held at Quang Nam provincial cultural centre, featuring photos from the festival by photographers from ten provinces in the region, showcasing images of nature, landscapes and people following Uncle Ho’s example, as well as socio-economic development and the cultural lives of local people. This year’s festival attracted 2,026 works by 289 photographers. After three rounds of judging, the 15 best pictures were chosen to receive awards. One gold medal went to photographer Nguyen Dang De with his work named ‘Red Sail’. Meanwhile three silver medals were presented to Vu Ngoc Hoang, Le Trong Khang and Mai Thanh Chuong. In addition, the Organization Board also presented four bronze medals and seven consolation prizes to other outstanding entries. After the award ceremony, the Organization Board organized the photo festival including 141 works. As estimated, the exhibition will close on August 01, 2016.